A homeless man is speaking out after the city of Detroit cleared out the spot where he lived. 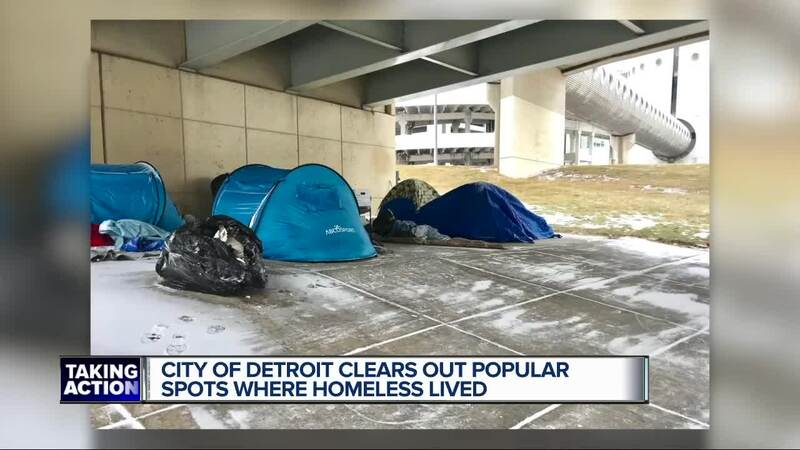 DETROIT (WXYZ) — "What they did was totally wrong," said 66-year-old Howard, a homeless senior, in tears. Despite losing parts of his fingers to frostbite a month ago, last night he says he was forced to sleep without much more than the clothes on his back, after the city, in conjunction with Detroit police, came through and wiped out the living areas of two popular spots acting as makeshift camps for the homeless: the underground area of Hart Plaza and this hidden spot underneath an overpass by Joe Louis Arena. Gail Marlow, of Motor City Mission, stocks food and supplies for the homeless in her trunk. But last night, she almost ran out after encountering several homeless who said everything they had accumulated through donations were now completetly gone, including tents, sleeping bags, coats, boots, hats, and survival backpacks -- all of which had been donated in a fundraiser to help the needy through the cold winter days. Also lost in the sweep? Homeless mats hand-made out of hundreds of recycled grocery bags -- each one entailing 50 hours of labor on the part of volunteers. With no opportunity to collect his critical documents, Howard says even his wallet and ID were taken in the sweep of items, and to make matters worse-- all of it happening just hours before the impending ice storm. The homeless senior says he's left feeling helpless and frustrated with the city, which he says, initially told dozens of homeless they could stay as long as they could clean up the area and bring it up to sanitation standards. As a Detroit resident, Howard says he expects more from the city and Mayor Mike Duggan than to be left out in the cold, empty handed. 7 Action News reached out to the city for response. They said they no choice but to take action due to concerns over safety regarding unsanitary conditions and the extreme weather. They say it was part of a larger goal to push homeless to move into more permanent housing. To do so, they say over the last two weeks, they worked in conjunction with some non profits to encourage temporary shelter until a more permanent solution could be achieved. In the end, some homeless did leave, while others decided to stay, citing past difficulties securing space at shelters.